One of the top priorities many Arizona homeowners have in a remodel is the floor. Typically, they want to replace the floors with something that is more modern and stylish, while also easier to clean. Many homeowners may not know it, but the perfect floor is usually lying underneath the carpet, tile, or linoleum that they are currently looking at. It’s the concrete slab! You can’t always remodel your floors with just any material. Sometimes, you don’t have the room for the thickness of the material. That means that you would have to make changes to the subfloor or to items inside the home, such as the HVAC vents, the baseboard, the door frames, and the window frames. Concrete overlays can be poured with a thickness of just ¼ inch, making them thin enough to fit into any existing floor plan without making major modifications. Concrete floor coatings in Peoria are very versatile. They go on as a liquid, so they can fill any space. You don’t have to fuss with cutting or shaping the material to get it to go around curves or into nooks. Just spread it where you want it. Overlays are similarly versatile in their design. They can be colored to just about any hue you would like. They can be stamped with a surface design or even patterned and textured. Clear sealer can also be added for shine and color enhancement. You have many choices for how you would like your floors to look. You can even add texture beads to it to make it more slip-resistant. Concrete lasts a very long time, and it is a hard material that stands up to a lot of damage. Concrete overlays are installed with a penetrating sealer that makes them more resistant to staining and scuffing. All you really have to do to keep these floors looking great is to maintain that sealer and to sweep and mop them regularly to keep dirt off them. Concrete is a low-maintenance floor that will last a long time without damage. Applying concrete floor coatings to existing concrete floors is a lot cheaper than installing new tile or other types of flooring. But even if you don’t have a concrete slab, you can apply a concrete overlay to the subfloor or another floor type. You can put an overlay right on top of linoleum, for example. Concrete overlays are much less expensive than a full concrete pour, which is typically about four to six inches. Choosing a concrete overlay or concrete floor coatings instead of tile or some other type of flooring is an environmentally friendly choice. You are taking advantage of the existing surface and using fewer materials to create a new floor. And since concrete is a longer-lasting material that is not as easily damaged, you won’t have to replace it as quickly as other floor types, making it a greener choice. If, for whatever reason, you one day decide that you no longer want your concrete flooring, you will be able to easily change it. You can lay down carpet, wood, tile, or linoleum right over the concrete. Or you can put area rugs on it to change up the look. It is versatile for current and future use. The success of a Peoria concrete overlay depends on the condition of the current floor. Whether you are laying the overlay on a current slab or putting it over subfloor or current flooring, you will have to deal with whatever issues are present. Is there a dip in the floor? Are there cracks, holes, or divots? The overlay will settle into these depressions, so they must be corrected before the overlay is installed. Otherwise, you will see these issues through the overlay, and they may cause cracking down the line. Correcting these problems may not be easy. It could involve pumping foam epoxy into the subsurface, leveling the slab with a concrete grinder, and more. You must hire an experienced professional with a great reputation to install any concrete floor coatings in Peoria. If the installer makes a mistake, it will be very difficult and expensive to correct it. The stain soaks into the concrete, so if it is not applied correctly, the concrete itself has to be removed and reinstalled to correct the mistake. Some people just do not like the feel of hard concrete under their feet and instead prefer carpet or other materials. If you are one of these people, you may want to think about the many benefits of concrete overlays before dismissing them as an option. You can always use area rugs for extra comfort to create a nice compromise. Overall, we are confident that you will find that there are too many benefits to concrete overlays to ignore them for your Arizona home or business remodel. 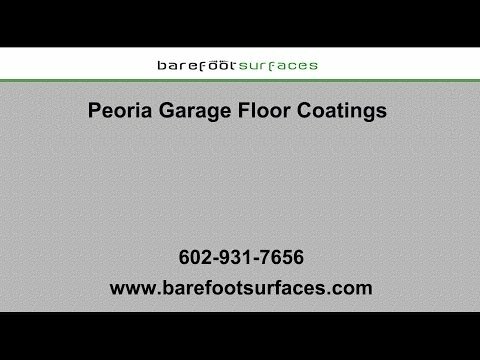 Barefoot Surfaces has been installing concrete overlays and concrete floor coatings in Arizona homes and businesses for many years, and we have earned a reputation as one of the best in the business. You can see from the gallery on our website the kind of beautiful results we provide for all kinds of spaces, including living rooms, office lobbies, and commercial garages. We offer concrete floor coatings in a variety of colors, textures, and patterns, ensuring that you have the options to get the look you want for your floors. Look through our gallery to get some ideas, then call us in Arizona to get an estimate for concrete overlays in your Arizona home or office.